The other two Republicans in the Top 10 were Rep. Dave Trott of Michigan, who ranked No. 5 with an estimated wealth of $177,149,145 and Rep. Vernon Buchanan who ranked No. 6 with an estimated wealth of $115,534,558. House Minority Leader Nancy Pelosi ranked No. 7 with an estimated wealth of $100,643,521—and was also one of only seven members of Congress whose estimated wealth exceeded $100 million. Sen. Mark Warner of Virginia, with an estimated wealth of $238,816,630, was the richest member of the U.S. Senate and the third richest member of both houses of Congress. The other five Democrats—in addition to Pelosi and Warner—who ranked among the ten richest members of Congress were: Rep. Jared Polis of Colorado ($313,556,221), Rep. John K. Delaney of Maryland ($232,816,089), Rep. Scott Peters of California ($95,569,028), Sen. Richard Blumenthal of Connecticut ($81,745,158), and Sen. Dianne Feinstein of California ($79,067,057). 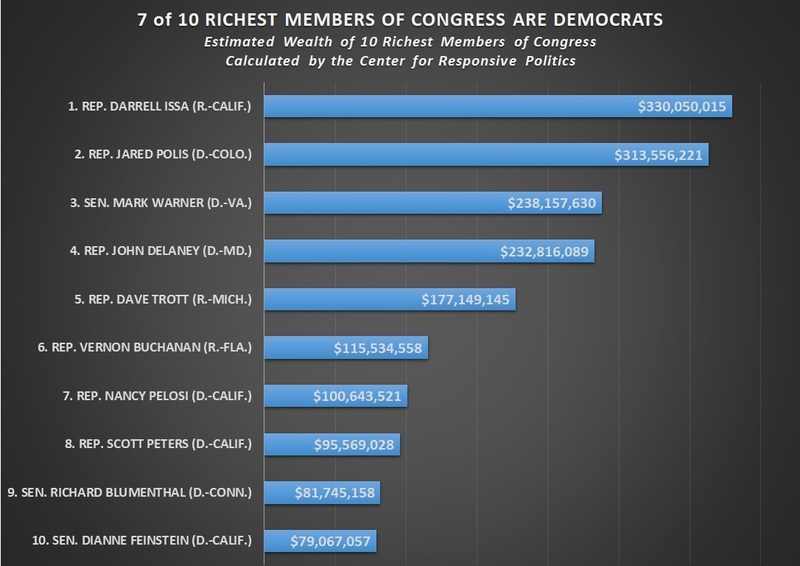 Four of the 10 richest members of Congress (Issa, Pelosi, Peters and Feinstein) are from California and two of those four are from the City of San Francisco (Pelosi and Feinstein). For more on the CRS’s ranking of members of Congress by their wealth, click here.